The field of St. Patrick's labors was the most remote part of the then known world. The seed he planted in faraway Ireland, which before his time was largely pagan, bore a rich harvest: whole colonies of saints and missionaries were to rise up after him to serve the Irish Church and to carry Christianity to other lands. Whether his birthplace, a village called Bannavem Taberniae, was near Dunbarton-on-the-Clyde, or in Cumberland, or at the mouth of the Severn, or even in Gaul near Boulogne, has never been determined, and indeed the matter is of no great moment. We know of a certainty that Patrick was of Romano-British origin, and born about the year 389. His father, Calpurnius, was a deacon, his grandfather a priest, for at this time no strict law of celibacy had been imposed on the Christian clergy. Patrick's own full name was probably Patricius Magonus Sucatus. His brief "Confession" gives us a few details of his early years. At the age of fifteen he committed some fault—what it was we are not told—which caused him much suffering for the rest of his life. At sixteen, he tells us, he still "knew not the true God." Since he was born into a Christian family, we may take this to mean that he gave little heed to religion or to the priests. That same year Patrick and some others were seized and carried off by sea raiders to become slaves among the inhabitants of Ireland. Formerly it was believed that his six years of captivity were spent near Ballymena in County Antrim, on the slopes of the mountain now called Slemish, but later opinion names Fochlad, or Focluth, on the coast of Mayo. If the latter view is correct, then Croachan Aigli or Croag Patrick, the scene of his prolonged fast, was also the mountain on which in his youth he lived alone with God, tending his master's herds of swine or cattle. Wherever it was, he tells us him self that "constantly I used to pray in the daytime. Love of God and His fear increased more and more, and my faith grew and my spirit was stirred up, so that in a single day I said as many as a hundred prayers and at night nearly as many, and I used to stay out in the woods and on the mountain. Before the dawn I used to wake up to prayer, in snow and frost and rain, nor was there any such lukewarmness in me as now I feel, because then my spirit was fervent within. "And one day the shipmaster said to me: 'How is this, O Christian? Thou sayest that thy God is great and almighty; wherefore then canst thou not pray for us, for we are in danger of starvation? Likely we shall never see a human being again.' Then I said plainly to them: 'Turn in good faith and with all your heart to the Lord my God, to whom nothing is impossible, that this day He may send you food for your journey, until ye be satisfied, for He has abundance everywhere.' And, by the help of God, so it came to pass. Lo, a herd of swine appeared in the way before our eyes, and they killed many of them. And in that place they remained two nights; and they were well refreshed and their dogs were sated, for many of them had fainted and been left half- dead by the way. After this they rendered hearty thanks to God, and I became honorable in their eyes; and from that day they had food in abundance." At length they arrived at human habitations, whether in Britain or Gaul we do not know. When Patrick was again restored to his kinfolk, they gave him a warm welcome and urged him to stay. But he felt he must leave them. Although there is no certainty as to the order of events which followed, it seems likely that Patrick now spent many years in Gaul. Professor Bury, author of the well-known "Life of St. Patrick", thinks that the saint stayed for three years at the monastery of Lerins, on a small islet off the coast of modern Cannes, France, and that about fifteen years were passed at the monastery of Auxerre, where he was ordained. Patrick's later prestige and authority indicate that he was prepared for his task with great thoroughness. We now come to Patrick's apostolate. At this time Pelagianism was spreading among the weak and scattered Christian communities of Britain and Ireland, and Pope Celestine I had sent Bishop Palladius there to combat it. This missionary was killed among the Scots in North Britain, and Bishop Germanus of Auxerre recommended the appointment of Patrick to replace him. Patrick was consecrated in 432, and departed forthwith for Ireland. When we try to trace the course of his labors in the land of his former captivity, we are confused by the contradictory accounts of his biographers; all are marked by a great deal of vagueness as to geography and chronology. According to tradition, he landed at Inverdea, at the mouth of the river Vautry, and immediately proceeded northwards. One chronicler relates that when he was again in the vicinity of the place where he had been a herdboy, the master who had held him captive, on hearing of Patrick's return, set fire to his house and perished in the flames. There is historical basis for the tradition of Patrick's preliminary stay in Ulster, and his founding of a monastic center there. It was at this time that he set out to gain the support and favor of the powerful pagan King Laeghaire, who was holding court at Tara. The stories of Patrick's encounter with the king's Druid priests are probably an accretion of later years; we are told of trials of skill and strength in which the saint gained a great victory over his pagan opponents. The outcome was royal toleration for his preaching. The text of the Senchus More, the old Irish code of laws, though in its existing form it is of later date, mentions an understanding reached at Tara. Patrick was allowed to preach to the gathering, "and when they saw Laeghaire with his Druids overcome by the great signs and miracles wrought in the presence of the men of Erin, they bowed down in obedience to God and Patrick." King Laeghaire seems not to have become a Christian, but his chief bard and his two daughters were converted, as was a brother, who, we are told, gave his estate to Patrick for the founding of a church. From this time on, Patrick's apostolate, though carried on amid hardships and often at great risk, was favored by many powerful chieftains. The Druids, by and large, opposed him, for they felt their own power and position threatened. They combined many functions; they were prophets, philosophers, and priests; they served as councilors of kings, as judges, and teachers; they knew the courses of the stars and the properties of plants. Now they began to realize that the religion they represented was doomed. Even before the Christian missionaries came in strength, a curious prophecy was current among them. It was written in one of their ancient texts: "Adze-head (a name that the shape of the monk's tonsure might suggest) will come, with his crook-headed staff and his house (the word chasuble means also a little house) holed for his head. He will chant impiety from the table in the east of his house. All his household shall answer: Amen, Amen. When, therefore, all these things come to pass, our kingdom, which is a heathen one, will not stand." As a matter of fact, the Druids continued to exist in Christian Ireland, though with a change of name and a limited scope of activity. They subjected Patrick to imprisonment many times, but he always managed to escape. In 439 three bishops, Secundinus, Auxilius, and Iserninus, were sent from Gaul to assist Patrick. Benignus, an Irish chieftain who was converted by Patrick, became his favorite disciple, his coadjutor in the see of Armagh, and, finally, his successor. One of Patrick's legendary victories was his overthrow of the idol of Crom Cruach in Leitrim, where he forthwith built a church. He traveled again in Ulster, to preach and found monasteries, then in Leinster and Munster. These missionary caravans must have impressed the people, for they gave the appearance of an entire village in motion. The long line of chariots and carts drawn by oxen conveyed the appurtenances of Christian worship, as well as foodstuffs, equipment, tools, and weapons required by the band of helpers who accompanied the leader. There would be the priestly assistants, singers and musicians, the drivers, hunters, wood-cutters, carpenters, masons, cooks, horsemen, weavers and embroiderers, and many more. When the caravan stopped at a chosen site, the people gathered, converts were won, and before many months a chapel or church and its outlying structures would be built and furnished. Thus were created new outposts in the struggle against paganism. The journeys were often dangerous. Once, Odrhan, Patrick's charioteer, as if forewarned, asked leave to take the chief seat in the chariot himself, while Patrick held the reins; they had proceeded but a short way in this fashion when the loyal Odrhan was killed by a spear thrust meant for his master. About the year 442, tradition tells us, Patrick went to Rome and met Pope Leo the Great, who, it seemed, took special interest in the Irish Church. The time had now come for a definite organization According to the annals of Ulster, the cathedral church of Armagh was founded as the primatial see of Ireland on Patrick's return. He brought back with him valuable relics. Latin was established as the language of the Irish Church. There is mention of a synod held by Patrick, probably at Armagh. The rules then adopted are still preserved, with, possibly, some later interpolations. It is believed that this synod was called near the close of Patrick's labors on earth. He was now undoubtedly in more or less broken health; such austerities and constant journeyings as his must have weakened the hardiest constitution. The story of his forty-day fast on Croagh Patrick and the privileges he won from God by his prayers is also associated with the end of his life. Tirechan tells it thus: "Patrick went forth to the summit of Mount Agli, and remained there for forty days and forty nights, and the birds were a trouble to him, and he could not see the face of the heavens, the earth, or the sea, on account of them; for God told all the saints of Erin, past, present, and future, to come to the mountain summit-that mountain which overlooks all others, and is higher than all the mountains of the West-to bless the tribes of Erin, so that Patrick might see the fruit of his labors, for all the choir of the saints came to visit him there, who was the father of them all." "It was not any grace in me, but God who conquereth in me, and He resisted them all, so that I came to the heathen of Ireland to preach the Gospel and to bear insults from unbelievers, to hear the reproach of my going abroad and to endure many persecutions even unto bonds, the while that I was surrendering my liberty as a man of free condition for the profit of others. And if I should be found worthy, I am ready to give even my life for His name's sake unfalteringly and gladly, and there (in Ireland) I desire to spend it until I die, if our Lord should grant it to me." Patrick's marvelous harvest filled him with gratitude. During an apostolate of thirty years he is reported to have consecrated some 350 bishops, and was instrumental in bringing the faith to many thousands. He writes, "Wherefore those in Ireland who never had the knowledge of God, but until now only worshiped idols and abominations, from them has been lately prepared a people of the Lord, and they are called children of God. Sons and daughters of Scottish chieftains are seen becoming monks and virgins of Christ." Yet hostility and violence still existed, for he writes later, "Daily I expect either a violent death, or robbery and a return to slavery, or some other calamity." He adds, like the good Christian he was, "I have cast myself into the hands of Almighty God, for He rules everything." Patrick died about 461, and was buried near the fortress of Saul, in the vicinity of the future cathedral town of Down. He was intensely spiritual, a magnetic personality with great gifts for action and organization. 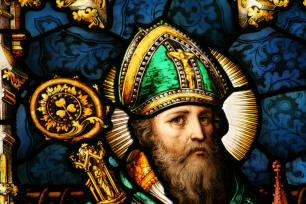 He brought Ireland into much closer contact with Europe, especially with the Holy See. The building up of the weak Christian communities which he found on arrival and planting the faith in new regions give him his place as the patron of Ireland. His feast day is one of festivity, and widely observed. Patrick's emblems are a serpent, demons, cross, shamrock, harp, and baptismal font. The story of his driving snakes from Ireland has no factual foundation, and the tale of the shamrock, as a symbol used to explain the Trinity, is an accretion of much later date. I arise today Through the strength of the love of Cherubim, In obedience of angels, In the service of archangels, In hope of resurrection to meet with reward, In prayers of patriarchs In predictions of prophets, In preachings of apostles, In faiths of confessors, In innocence of holy virgins, In deeds of righteous men.I arise today Through the strength of heaven: Light of sun Radiance of moon, Splendor of fire, Speed of lightning, Swiftness of wind, Depth of sea, Stability of earth, Firmness of rock. I arise today Through God's strength to pilot me: God's might to uphold me, God's wisdom to guide me, God's eye to look before me, God's ear to hear me, God's word to speak for me, God's hand to guard me, God's way to lie before me, God's shield to protect me, God's host to save me From snares of devils, From temptations of vices, From everyone who shall wish me ill, Afar and anear, Alone and in a multitude. I summon today all these powers between me and those evils, Against every cruel merciless power that may oppose my body and soul, Against incantations of false prophets, Against black laws of pagandom, Against false laws of heretics, Against craft of idolatry, Against spells of women and smiths and wizards, Against every knowledge that corrupts man's body and soul. Christ shield me today Against poison, against burning, Against drowning, against wounding, So that there may come to me abundance of reward, Christ with me, Christ before me, Christ behind me, Christ in me, Christ beneath me, Christ above me, Christ on my right, Christ on my left, Christ when I lie down, Christ when I sit down, Christ when I arise, Christ in the heart of every man who thinks of me, Christ in the mouth of everyone who speaks of me, Christ in every eye that sees me, Christ in every ear that hears me.